The cross laminated tulipwood structure is an innovative project designed by Alison Brooks Architects and and engineered by Arup. 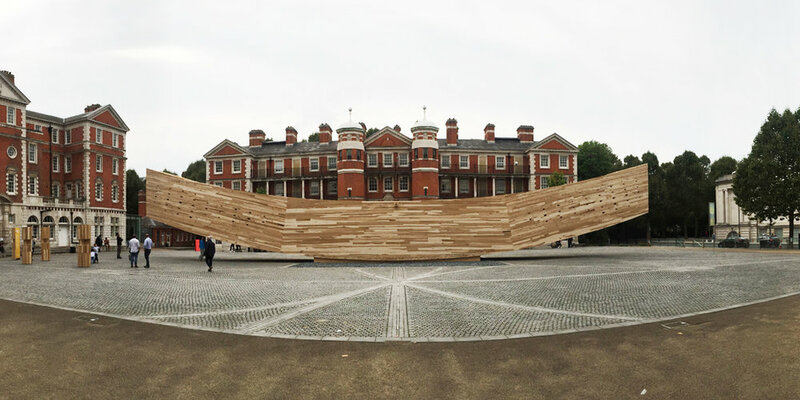 The striking installation aims to challenge the way architects and engineers approach timber construction. The curve of 'The Smile' represents a section of a 50m radius circle and is the most complex CLT structure ever built. With access at ground level in the centre, the construction was a vast engineering challenge. Constructed using Tulip timber, the Smile is sustainably sourced. The native American hardwood grows straight and tall with few knots. It is easy to machine and crucially in this case, very strong for it's weight. The pale colour and natural swirling patterns make it an innovative newcomer for timber construction. Cleverly, the perforations in the walls disperse the stress on the curve - more concentrated where there is less structural tension. The designers sketch shows the likeness of the concept to the final interpretation after much engineering and testing. There is something childlike about being inside the Smile and although strictly forbidden there was a very strong urge to run from one end of the curve to the other. It's easy to overlook the feat of structural engineering that went into the project and simply admire the beautiful cross laminated timber construction and subtle lighting details.